The FSA has belatedly acted on the blatant and obvious to all market participants manipulation of the LIBOR reference rates for various markets including interest rate derivatives. Most market participants had concluded that the LIBOR rate as published by the BBA cannot be accurate and to on occasion an extreme extent at several points during the past 5 years of the financial crisis. The FSA action that amounts to a £290million fine is of little consequences to Barclays because the Bank of England in collusion with the UK Treasury have been busy stuffing every orifice of all of the banks with free cash under the constant threat that if tax payers did not provide unlimited cover for liabilities then the banks would trigger Financial Armageddon which ironically did not stop RBS from exploding last week, freezing millions of account holders in what amounts to a 2 week bank holiday. What is LIBOR and Why Barclays, Banks, and Central Banks Manipulate it. The London Interbank Offered rate (LIBOR) is the benchmark reference for rates banks charge one another for borrowing funds over various durations ranging from overnight to 2 years that directly has an impact on the rates that banks charge it's customers as most of the monies loaned out by the major banks are borrowed from other banks, insurers and investors, which is why the freeze in the interbank market as a consequence of bank contagion risks prompted global central banks to take extreme measures to force liquidity into the banking system by various means such as direct loans to banks and QE. That is the basic picture that the mainstream press is aware of, the truth is what the Government fears you knowing, and that truth is that the banks have increasingly leveraged themselves up on interest rate bets over the past decade on the off exchange derivatives market based on LIBOR and other similar benchmark rates, therefore a small change in LIBOR can have a huge impact on derivatives contracts. We are not talking about billions, or hundreds of billions, or even trillions, we are talking about HUNDREDS OF TRILLIONS of exposure, more than enough to trigger a collapse of the global financial system several times over. Virtually all of the present mainstream press commentary is centred around the fact that Barclays somehow made huge profits on the blatant attempts to manipulate the banks reported LIBOR rates lower. However this is less than HALF of the actual story, the fact is that the prime reason why senior bank staff jumped onboard the LIBOR market manipulation band wagon several years ago was to give the illusion to the market of solvency during credit crisis extremes when the LIBOR market would freeze, when the reality was that Barclays along with all of the major banks were Insolvent, bankrupt, having made and lost huge over leveraged sums that were many times the amount of capital the banks had hence the banks lied, lied about virtually everything including LIBOR to prevent market panic and a Lehman's style collapse. Off course to prevent actual insolvency required huge amounts of capital injections, loans and other extreme measures such as QE free money to prevent bankruptcy which the politicians who are highly critical today have been more than culpable in offloading onto the backs of tax payers starting in September 2007 with the Northern Rock bailout. If the LIBOR rate manipulation story is followed to its logical conclusion then it will eventually be found out that the banks received a nod and a wink from the Bank of England to under report their LIBOR rates as an panic measure (one amongst many) to avert financial armageddon and promote financial stability, given that it has taken this long for Barclays culpability to emerge then the Bank of England and Governments role in market manipulation of interest rates won't be being reported on in the mainstream press anytime soon, and it should not be forgotten that Quantitative Easing (QE) of £325 billion to date has been for the purpose of manipulating market interest rates lower across the yield curve, all the way from short LIBOR right through to the long dated Government Bonds. This is a FACT, the Bank of England has manipulated the market interest rates lower between banks and for government bonds but not for retail customers. The BBA is responsible for compiling and reporting the daily LIBOR rates, and thus has a better understanding of the market than most market participants, especially at times of serious deviation from the the actual rates banks were offering to counter parties. Instead of owning upto responsibility, representatives of the BBA have been busy all day offloading responsibility onto others with comments that the BBA had out sourced the process of compiling rates. This illustrates a banking sector that acts outside the law and in totality amounts to nothing more than an cancerous growth on the backs of ordinary tax payers who continue to be held liable and pay for the continuing crimes of bankster's. However it is not surprising that the BBA is trying hard to wriggle out of responsibility, for there allegedly exists evidence that it knew precisely what was going on but went ahead any way, year after year, reporting misleading information to potential investors on the risks posed by bank offered debt products, which lawyers all across the globe will be busy analysing in terms of damages. 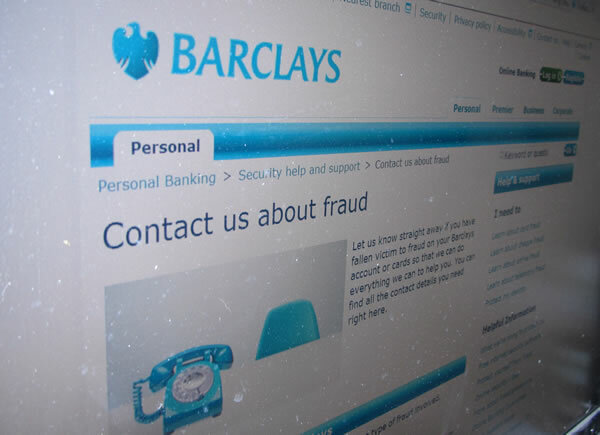 Similarly the Barclays website asks customers to contact the bank about fraud, need not worry for they WILL be being contacted for recompense for telephone number amounts of damages in the near future, the bills for which will ultimately be passed to the tax payers of Britain. Did RBS / Nat West Weapon of Mass Financial Destruction Just Explode? The UK economy has been sitting on a huge ticking time bomb, it's banking sector where total debt and liabilities extend to at least X4 official public debt of 1.3 trillion, where RBS alone has liabilities of over £1 trillion that have been dumped onto tax payers so is more than capable of bankrupting Britain on its own should it explode as a consequence of over leveraged positions (gambles) exploding due to contagion third party failure impact no matter where it emanates out from i.e. the present focus is on exposure to the bankrupting euro-zone. The facts are this and they have remained a constant for the duration of the financial crisis when it first broke in June 2007 . The facts are that ALL of the banks are bankrupt, insolvent as a consequence of over leveraged bets made to bank short-term bonuses that keep blowing up in their faces, the latest bets to blow up were made AFTER Lehman's went bust and the banks were bailed out with cheap tax payer monies that they plowed into the bonds of Euro-zone PIIGS. This is what Quantitative Easing is, a policy of funneling unlimited cash into the bankrupt banks so that the banks do not go bankrupt and default. This policy that the likes of the Bank of England has rammed down the throats of ordinary tax payers by means of gullible, inept and incompetent politicians such as Britain's Brown, Darling and now Osbourne who are more than eager to give the illusion of knowing what they are doing to the general public by following the recommendations of central bankster's. Now the consequences of this policy of bailing out bankrupt banks is ultimately that they will bankrupt ALL NATIONS, because the amount debts and liabilities are many times greater than each countries ability to cover these liabilities for instance for the UK, it would amount to about £5 trillion pounds. The defacto closure of RBS, freezing of customer bank deposits illustrates the point that the banks are in effect a cancerous growth on the back of Britain that are continuing to eat the economy alive, rather than accept the unlimited liabilities of the banks, instead they should be treated as insolvent institutions and result in the process of bankruptcy to take place for bond holders and investors, else the current situation of an Inflationary Depression will continue INDEFINTELY! Because it is going to take a hell of a lot of inflation to inflate the debt away, forget 3% per year , but more like 3% per MONTH! Now, don't take that as a forecast as 3% per month would amount to a series of events resulting in loss of confidence in fiat currency, such as the UK government bond market rates breaking above 3% first then spiraling ever higher, such events do not appear to be on the horizon for the UK for the rest of 2012, instead Britain continues to suffer the consequences of bailing out the banks and their bond holders in terms of the continuing Inflation Mega-trend and its consequences in terms of loss of purchasing power as illustrated by the CPI Index. My next in-depth analysis will take a detailed updated look at the UK's critical debt crisis before it explodes, as many of the forecasts trends of several years ago are resulting in an significantly worse fiscal position than even my pessimistic expectations of June 2010 (UK ConLib Government to Use INFLATION Stealth Tax to Erode Value of Public Debt ), as clearly Britain is accelerating towards bankruptcy, ensure you are subscribed to my always free newsletter to get this analysis when complete in your email in box. 22 Jun 2012 - Did RBS Hit the Greece Election Eurogeddon Bank Holiday Panic Button by Mistake? So what will be next weeks bankster fraud revelation ? Copyright © 2005-2012 Marketoracle.co.uk (Market Oracle Ltd). All rights reserved. I love reading your articles, however i think recently you have also become all about doom, gloom and fear. I think the blogs of fear must be getting to you? One of the reasons i love reading your articles during the bad times was because it gave hope, however at the moment the markets aren't that bad yet your articles only talk of Armageddon. Ive several times concluded that FA would be good news for the markets because it will result in resolution of uncertainty. And the actual trend forecasts are for a positive outcome. Thank you for your article above. I don't really understand LIBOR except that it is something to do with market interest rates and they affect some types of mortgages. I thought the ten year gilts affected some of the longer term fixed rates, so I assume LIBOR affects more the short term fixed or tracker mortgages. May I ask how does this scandal affect mortgage rates. Did the manipulation help to push mortgage rates down or up? If it was down, then what implications does this exposure have for mortgage rate holders going forward? I remember a brief period of very low tracker rates (and fixed rates) before they all went up quite considerably, despite the ten year gilt yield keep going down! I questioned a Barclays representative about this, but they had no understanding whatsoever on how their rates were determined, accept the fact that "Head Office" decides. How incredible. I also asked about "typically" (see below) and why this had changed recently. Again no satisfactory response. I fear the worst. My mortgage is linked to BBBR. It is a tracker. How likely would this scandal affect the Barclays base rate. I noticed recently that the Barclays base rate "typically" follows the bank of england base rate. I don't like the sound of "typically". Does this mean they can change the Barclays base rate to a different rate than that of the Bank of England? Is this what you think might happen if bank of england base rates go to zero or negative? I am seriously starting to wonder how exposed I am to the whims of Barclays rate policies (or any UK bank for that matter)going forward. Ideally, I would not want a mortgage (for obvious reasons) but unfortunately have no choice in the matter currently. Your best advice regarding any potential issues would be greatly appreciated. I am just a layperson with a family trying to navigate through the dark printing presses of the Bank of England and their chums! My main question though is whether you think this exposed scandal will affect mortgage rates negatively or positively in the near future (short to medium term). Many thanks for trying to answer some of these questions. Oh and one last question. Why do you feel buying a house in this country is a good idea. Why not buy a house in another country - a stronger country where the currency is not being devalued to such a great extent. If the UK experiences hyperinflation, then any nominal increase in the house price would be relatively worthless in a period of hyperinflation. Are you looking long term in your outlook? Do you think the UK will experience hyperinflation? If so, why not advise a different currency or currencies to store one's wealth, or a foreign bank account in a much stronger currency offering over 6%? Mortgage rates have not been reflecting the official rates for at least 5 years, because the official market rates are artificial, manipulated rates to the maximum extent to profit the banks so that they do not go bust and collapse the financial system. The banks profit on the gap between the rates they borrow at and the rates they lend at, the wider the gap the greater the profit. The Bank of England and the politicians by their actions rather than their words, show that they SERVE THE BANKERS. I don't think this scandal will effect mortgage rates because they are already detached from the artificial interbank rates i.e. you pay a LOT higher than LIBOR, when in the past the spread was very close, usually less than 1% instead of more like 3-4% today. I.e. in 2007 LIBOR was about 6% and so were mortgage rates. Today it's less than 1% and mortgages are 4-5%. Yes Barclays could have manipulated your mortgage rates higher at times by OVER reporting LIBOR i.e. if they were offering a fixed rate mortgage then they could have pushed up their LIBOR rates so that the FIX is made at a higher rate. I think the main victims were counterparties to the derivatives contracts that are sensitive to small fluctuations in LIBOR, which is mostly other banks. Because they cannot print houses, and unlike Spain and the US, there has been NO building boom, Now I am not saying that they will soar in price for an in-depth trend forecast is pending for an answer to that Q, but probability clearly favours house prices rising. Buying a house in another country is a recipe for disaster, they are not liquid, you need to factor in the costs of flowing too and fro for all of the legal consequences that will crop up from time to time. This is something that those that bought in Spain have been finding out. As a British citizen living in Britain, you will NOT be aware of all of the ramifications of buying abroad until the SHTF. The safe haven play is to buy UK property. HYPERINFLATION - Is a panic event, IF it happens, after the dust settles you would still have an asset that will be priced by the market instead of a wheel barrow full of worthless currency. On the strength of this single article35374, my son has decided that he shall not return to his English University in September for the 3rd year of his history degree. Instead he shall relocate before Autumn to Australia (he has an Australian passport). 1) The banks shall collapse over some one night in Autumn, whereupon people shall not be able to get their money out, money shall become worthless overnight, people shall not be able to get enough food (Britain is only 60% self-sufficient in food production). 2) The recession shall instantly become another Great Depression, only this time we shall not be able to afford soup kitchens because the national debt in the 30s was trivial compared to today and money value was anchored to the gold standard. So my son paints a bleak Doomsday scenario. But have we not got more time than that? Shall the dominos not tumble into each other rather more slowly? In regards to the derivatives excesses, shall these not play out years into the future - i.e. what are the maturity settlement dates of most of these? For clarity, I would greatly appreciate it if you could either confirm or deny some or all of his fears, or at least the timetable around their materialising. Sir, nobody knows the future, especially a history major. No the world financial system will not end in the timeframe your son has mentioned. Frankly, moving to australia would be nicer than wasting money on a worthless degree in england. It would be nice if he could get a refund on the money spent. The mega-trends favour Austrailia for the long-run. Someday it will rival the US in economic and military power! 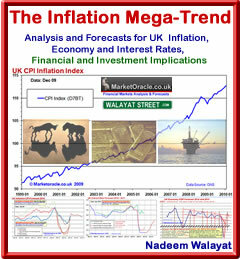 The UK has been in an inflationary depression for four years that will run for this whole decade. There is always a risk that inflation will get out of control and risks resulting in a series of hyperinflationary panic events. As things stand, the ongoing banking and debt crisis events will be met be ever expanding waves of money printing. 13 Jul 12, 03:04 Australia, an economic and military power? I thoroughly enjoy reading your articles. As an Australian, I was very surprised to read your statement that one day Australia will rival the US in economic and military power! If you wanted to get someone's attention, then a statement like that would certainly do it. I would be very interested if you could give a quick explanation by that statement.